Having a prior uterine surgery increases the risk of uterine rupture. The relative risk is still low, but it’s there. But sometimes there is no “reason” for a uterine rupture other than a prior cesarean. 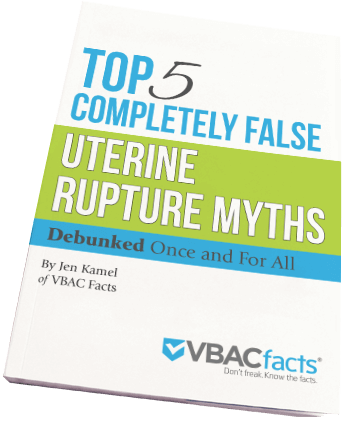 Uterine rupture stories illustrate that even though the risk is ~ 0.4% (among those with one prior low transverse cesarean in a spontaneously laboring VBAC), that small number impacts real parents & babies. Sometimes, outcomes are good. Other times, not good. And many things impact how a uterine rupture plays out. This specific uterine rupture survival story is an excellent example of two things. A tell tale sign in this situation was the sudden, sharp pain that persisted between contractions. This is a well-documented sign of uterine rupture which should have prompted further review rather than suggesting the mother get an epidural. Two, birthing parents, listen to your instincts. They are almost always right. Even if it’s your first labor, if you feel that something is wrong, keep saying what is happening until someone listens. “I was not induced, I went to 41.4 weeks and naturally went into labor. I labored for 4 hours and then suddenly had this sharp pain in my lower right abdomen that was so strong and continued through contractions- the nurses knew and shook it off (they just thought I was being a pain because I didn’t want an epidural.) I literally asked if there was a chance that I ruptured because I read someone else’s story on here about their rupture. It finally became so intense I did ask for an epidural and thankfully I did because the next morning while still laboring, my daughters heart rate dropped and we rushed into emergency c section. When they moved me from my bed to the operating table, I started bleeding out and when my OB cut into me, she informed me that I had ruptured. She had never dealt with a rupture and it was clear. She kept saying she couldn’t get the baby out and I could tell she was a little frantic. My baby busted through the corner of my last internal suture and that’s where I felt the pain between contractions (listen to your bodies ladies – you know when something is wrong and my nurses didn’t listen). I literally started telling my husband to take care of the babies if I didn’t make it. I know this is scary but it’s real. I’m not trying to scare anyone. I still support those who wish to have a VBAC. What happened to me is RARE. As a birth professional, your clients turn to you when they need information. Providing them with emotional support and accurate information gives parents the foundation they need to make truly informed decisions. If you would like to quickly get up to speed on the evidence, and easily stay current, then click here to join the VBAC Facts Membership for Professionals. I reflect back and question whether or not certain things increased my likelihood for rupture. If I could go back in time, I’d adjust those things knowing that there was still a chance of rupture. I don’t regret attempting my VBAC. I am very much a VBACtivist and believe wholeheartedly that VBACs are an excellent option for many women. It must be a choice option for mothers. What are the things you would adjust? Yes, what are the things you would adjust? Thank you so much for sharing your story. It is scary, but it is important to hear the scary stories so we can make truly informed decisions when deciding to try for a VBAC. I’m so glad your story ended happily!